The last community consultation over the Weston Hub was held Wednesday night and it seemed to be designed as a bit of a cheerleading session in the form of a snoozefest. Members of the Weston Village Residents’ Association (which has supported the project from day 1) seemed to make up a good number of the audience of about 100. Audience members seemed split between total support, support but concerned by the negative aspects and those opposed. It’s fair to say that a fair number in attendance seemed ready to swallow the negatives of a 30-storey tower, townhomes and a storage facility as the price to be paid for 26 live-work spaces for artists and some space for community organizations. Refreshingly, no major surprises were unveiled and one or two minor tweaks were announced that will improve things but the bottom line seems to be that the project is now a ‘go’ and will be presented to the Etobicoke York Community Council for approval in November and then to City Council in December. In the question period, in spite of Toronto Chief Planner Jennifer Keesmaat’s insistence that the majority of people are overwhelmingly in favour of the project, several people spoke against it, some having reservations about the 8-storey building limit being set aside. Dan Harris wondered what new rabbit (e.g. storage) was to be pulled out of the hat. Another interesting comment came when a resident asked if Affordable Housing would consider allowing low income tenants to occupy the rental building if the developer failed to secure enough tenants (he hoped they would consider it). Developer Jack Winberg responded that there is every indication that the building will be filled by market-rate tenants. The affordable housing rep said he would look into it if approached by the developer. The fire route will now be along King and John Streets rather than through the ‘community space’. The townhouse base of buildings along John Street will be adaptable to commercial. There will be a 30-storey rental apartment building and large storage facility. According to Ms. Keesmaat, the rental tower was never negotiable. The Farmers Market space will be smaller than the space currently in use. The storage lockers won’t provide much employment but won’t produce much traffic either. 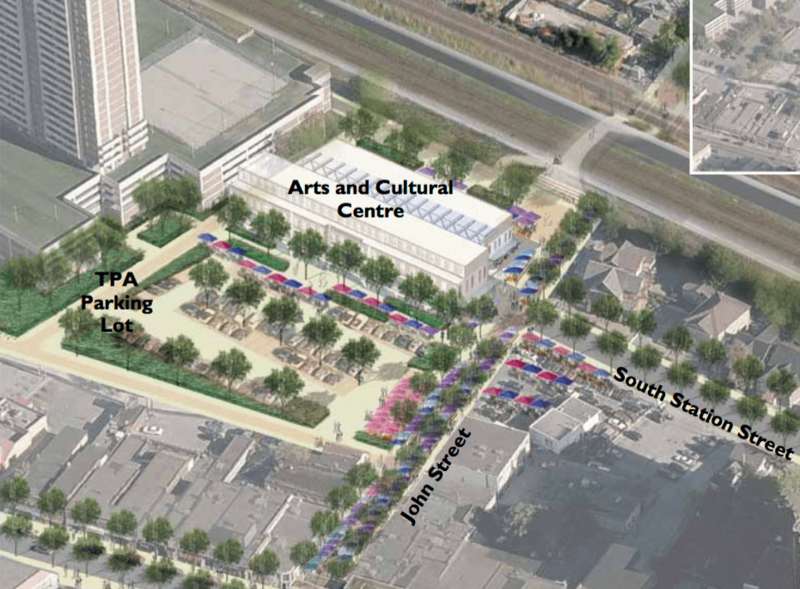 On the other hand, the site will be attractively landscaped with a small (but perfectly formed) public area and there is a possibility that the Artscape portion will work and be a roaring success. Ms Keesmaat claims that the project is a special opportunity for Weston and a special effort to bring re-investment into Weston. Only time will tell how ‘special’ it will actually be.